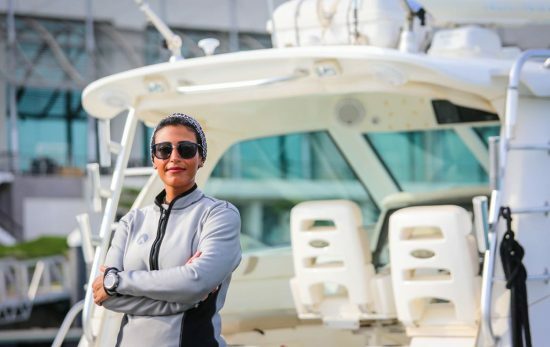 Birgitta Mueck, one of our PADI AmbassaDivers, shows us the thrills of dive exploration with this exclusive 3-part account of her latest cold water adventures. 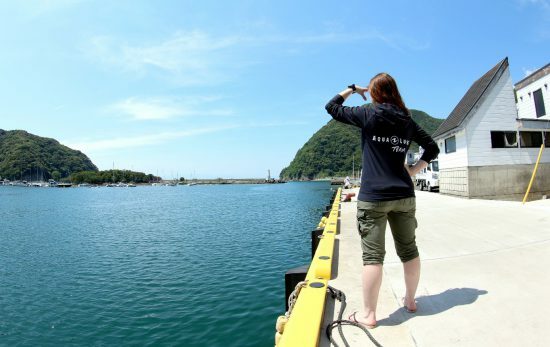 Sailing through the northern fjords of Sweden and Norway, Birgitta has searched for deep, rare species and pods of feeding orcas. In part 2 she comes face to face with the elusive ”Mystical Fairytale Creature”. Our voyage continues to Trondheimsfjorden, which is a fjord in the west-central part of Norway where I have spent plenty of time before. This is the fjord where the world’s shallowest cold-water coral reef, Lophelia pertusa, is located. Here grows deep-water species of reef building coral, which normally lives at depths between 100-1000 meters or more. 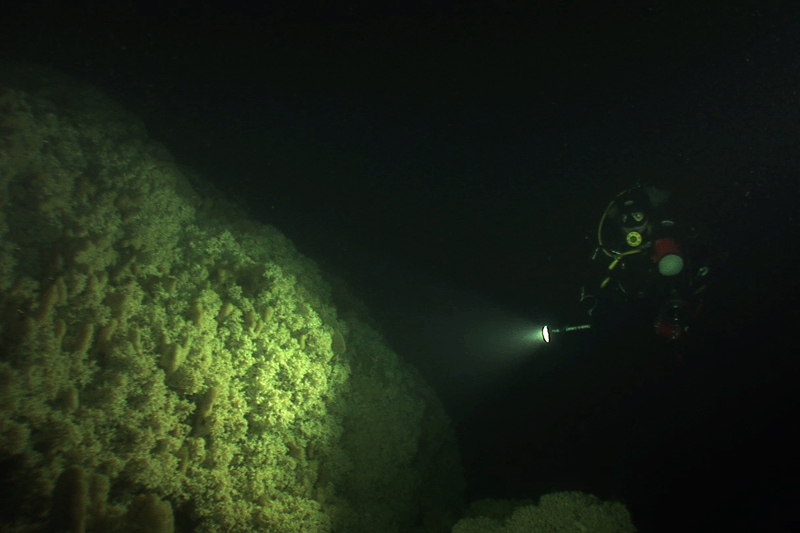 In 2000, a local diving club “Leksviks dykkeklubb” found this extraordinary reef at a depth of approximately 40 meters inside Trondheimsfjorden. 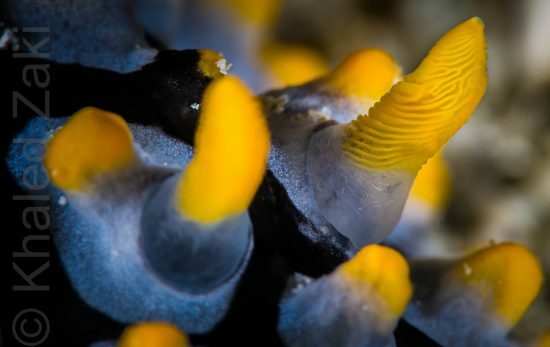 Since then, it has become the shallowest cold-water coral reef known to the world, and the main reason for my many dives at this particular spot. This time however, we are here to film something totally different. Our aim is to find and document a mythical creature with the latin name of Chimaera monstrosa meaning ”Mythical Fairytale Creature”, which I find suits this extraordinary being very well. The ghost shark, also known as rabbit fish, rat fish or spook fish, is a deep water creature normally living a hundred meters deep. 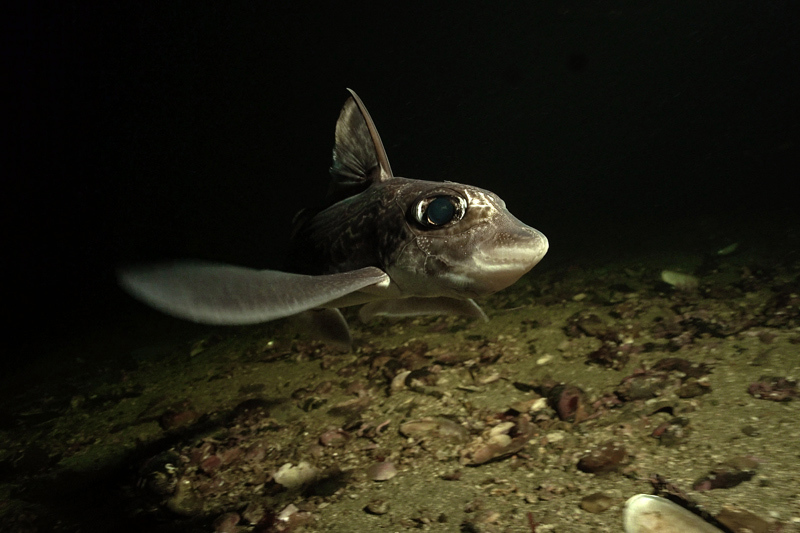 But in some of the Norwegian fjords, such as here in Trondheimsfjorden, there are places where the ghost sharks can be found in much shallower water when diving at night. Therefore to be able to find them we will need to dive at night. We anchor at the spot where we hope to have a chance to find the mysterious creatures we are looking for. Once the darkness has arrived, it is time for us to jump into the rather ”refreshing” water. As expected the water temperature decreases as we go north and my dive computer now shows 10°C. Surrounded by the enormous amount of glowing bioluminescent plankton, we start descending along our 30 meter long anchor chain and soon turn on our underwater film lights to be ready to document any encounters. Some cod fishes and a small lobster are the first critters I see next to the small wreck resting on the sandy bottom. At a slow pace, I cautiously swim into the infinite dark surrounding us, carefully looking all around me. It doesn’t take long before I see, further in the distance, two eyes reflecting the light. I stop and patiently wait for the creature to come closer. While hovering just above the seashell decorated sand-bottom, all my attention goes to the glowing eyes in the dark which are getting bigger and bigger the closer they get. 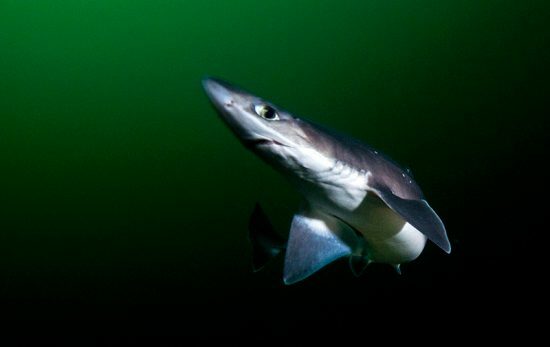 There is no doubt about it, it is a ghost shark! With slow movements, it makes a couple of loops around me, before settling down on the bottom again, continuing to search for food among the dead sea shells. Like most sharks and rays, which are their closest living relatives, ghost sharks have cartilaginous skeletons. They can grow up to 1.5 meters long and mainly feed on bottom-living invertebrates. For defence, this cute little fellow has a venomous spine located in front of the dorsal fin. Being a very peaceful creature, there is no need to worry when diving with this friendly-looking fish, as long as you behave in a good and respectful manner. The time underwater feels way too short when diving with these magnificent animals (as I haven’t found a way to start growing gills like a fish yet!) and it’s too quickly time to wave goodbye to my nocternal, aquatic friends and start our ascent back to the boat. It is already the second week of October and we have now only a couple of weeks left before the whales should start to appear in the fjords of Northern Norway. Time for us to head even further north and sail our remaining 500 nautical miles, hopeful to soon meet the whales. Its such a wonderful feeling when we finally reach the northern part of Norway, after close to a couple of months on the move sailing our boat along the beautiful coast. We are now entering the Arctic circle and we don’t have many days left before finally reaching the mountainous county of Troms in Northern Norway. Both Orcas and Humpback whales have annually been flocking to the area in astounding numbers, but will the herring and the whales show up again also this year? Nature only knows and only time will tell us. We find a nice little fishing harbour on Vengsøy island, where we decide to base ourselves for some time. This charming island is situated slightly west of Tromsø, and is one of the spots where the whales normally appear during late October. My gut feeling tells me that this is the place to be to hopefully find some whales soon. Every day that passes by gets shorter and colder. When the long dark nights are clear, the sky often puts on its own fabulous show with the amazing northern lights. The snowy mountain peak landscape surrounding us is simply breathtaking, and so is the everlasting sunrise and sunset that envelops everything in its stunning light. No matter if its sunny or grey, the ever changing scenario surrounding me never stops to impress. Such amazing scenes both day and night, but where are the whales? 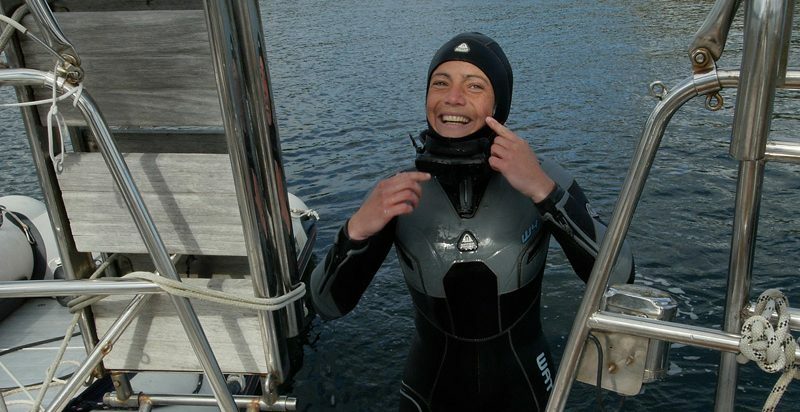 Will Birgitta and her expedition finds the orcas and whales? Continue to follow her cold water adventures in Northern Tales: Part 3 next week!